Smart and elegant pocket knife! As epitomized in its name, this tool is smart and houses perfect gadgets without adding too much bulk. There are 7 important implements that grace this pocket knife. The 7 useful implements that this tool encompasses are: blade, nail file with screwdriver, scissors, key ring, tweezers, and toothpick. A keychain compactly holds all these implements and it fits perfectly in your pocket without adding too much weight. 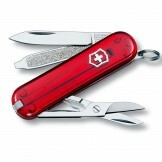 With the guarantee of usual quality that Victorinox products have, this product also meets the highest standards of quality and lasts a lifetime. What more do you need from this compact and small tool? It saves your day every time you run into a problem. Whenever you need to fix a situation, one of the tools of this pack makes a grand entrance like a superhero to save you. Indeed, no small tool saves the day so often like this tool does! Currently available on dawaai.pk, online shopping e-commerce store in Pakistan, with lowest prices and free delivery (terms & conditions apply).Offering Victorinox Swiss Knife 0.6223.T with fast shipping in Karachi, Lahore, Islamabad, Quetta, Peshawar, Rawalpindi and many other cities of Pakistan.